The incidence of Bile duct injury (BDI) during laparoscopic cholecystectomy (LC) ranges from 0.5 – 1.4%. Roughly half of these have been reported to be major BDIs. Although studies have shown that the overall incidence of BDI does not change with the routine use of intra-operative cholangiogram (IOC), the question about the severity of the injury being limited by routine IOC has not been settled. Beginning in 1989, all patients who had laparoscopic cholecystectomies performed by a single surgeon (RJF) were enrolled in a prospectively maintained database of consecutive LCs. Following IRB approval, this database was queried for information on patient demographics, clinical presentation, intra-operative findings and operative complications. Statistical software SAS 9.2 was used to analyze the data. A total of 2360 patients, with a mean age of 46, BMI of 30.6 and a gender ratio of 1: 2.6 (M: F) had LC. Before 1996, IOC was done selectively. After that a policy of routine IOC for all patients was adopted. The result was that 1910 of the 2360 patients underwent IOC. The overall surgical complication rate was 2.2% (52 of 2360 patients), including both minor and major events. Five patients (0.2%) had biliary complications after the operation; all were Strasberg type A – BDIs i.e. minor ductal injury due to cystic duct leaks or leaks from small ducts in the liver bed. Two of these BDIs were recognized at surgery and were treated by repair and T-tube drainage. One patient had a post-operative ERCP with a biliary stent. Percutaneous drainage resolved the leak in another patient. The last patient presented with severe abdominal pain 5 days post-operatively and was explored with a washout and drainage. There were no major bile duct injuries seen in our patient cohort. 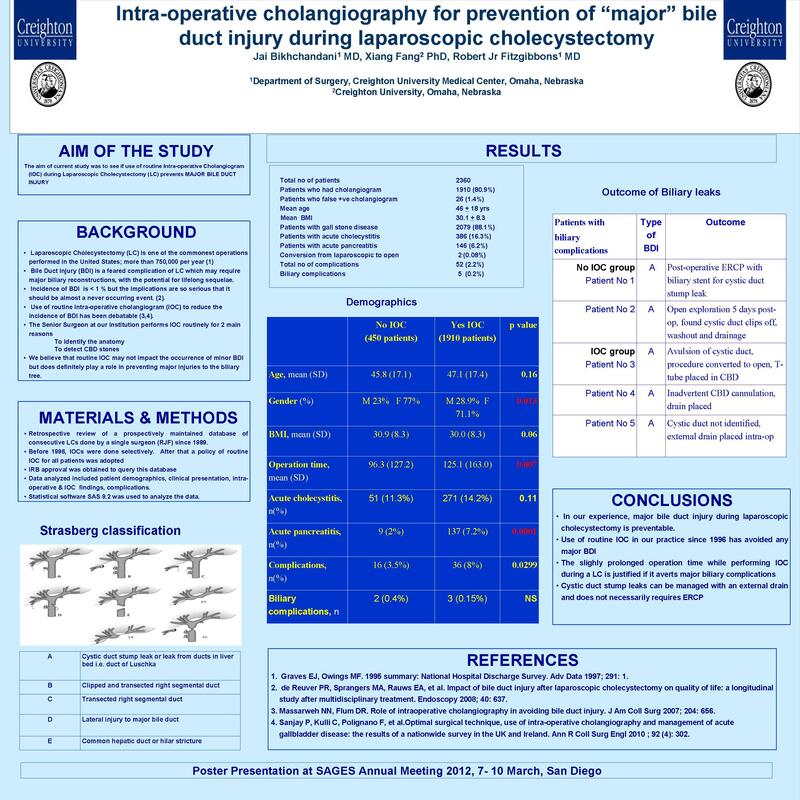 In our experience, routine IOC has been shown to be helpful in preventing major BDIs during laparoscopic cholecystectomy. There was however, no difference seen in the incidence of minor biliary complications in the patients who had routine versus selective IOC.